Walking out the door of the airport in New Orleans, the heat and humidity hits like a brick wall. Took the shuttle to the Central Business District, and met my wife at the Renaissance Pere Marquette. Dropped off the luggage and went for a walk. Found the French Quarter and went for a stroll down the length of Bourbon Street to the land of the rainbow flags, at which point we turned around and walked the other side of the street - not in a figurative sense. It was just past five o'clock, but the party was already getting started. It's like the line in Alice's Restaurant "you can get anything you want" on Bourbon Street. A friend had recommended Acme Oyster House for dinner, but the line was already down the block nearly to the corner by 7, so we popped across the street to Felix's and the food was fantastic. 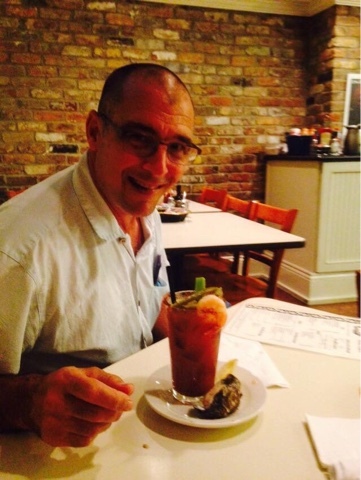 One of their signature Bloody Marys, a Hurricane and a plate of Oysters Rockefeller to start - delishus! Had a great plate of fried seafood with just the right amount of spice, and called it good.